It's been a while since Leo sat down with a brand new app and just took off with it, but that's what happened with Injini's new Write My Name handwriting practice app ($1.99). Yay! Leo deserves a fun, crisply designed, intuitive and customizable app to help support his reading and writing skills. You're probably thinking that there are a lot of handwriting practice apps out there, and you're right -- but this one is different, this one is superior. These photos and video are from the very first time Leo sat down with Write My Name. He was delighted -- he immediately plowed through word after word, animation after animation, letter sound after letter sound, reinforced learning opportunity after reinforce learning opportunity. What's unique about Write My Name? There is plenty of competition in the tracing app category but our features can make a significant impact for children who struggle to learn how to write. 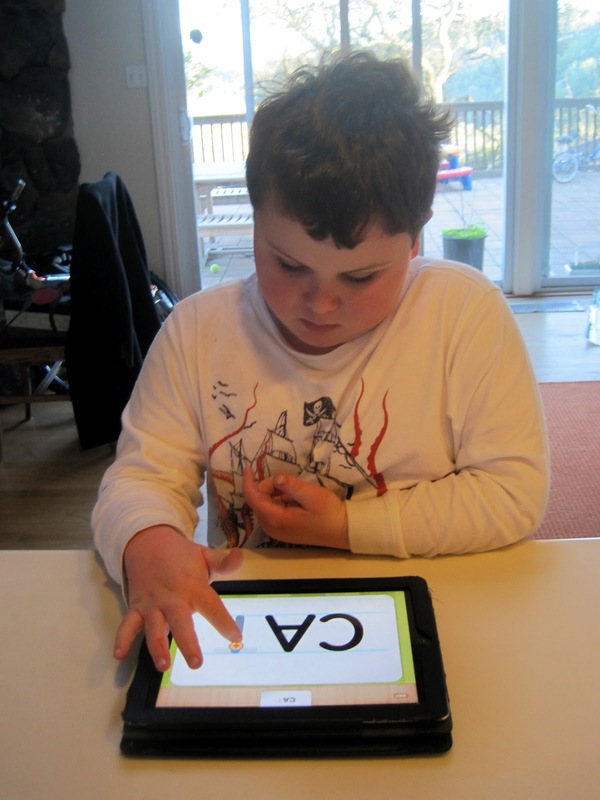 In the same tradition as Injini Child Development Game Suite and My First AAC, Project Injini was inspired to create Write My Name to help children with special needs practice emerging writing skills in a fun and playful way. Mastering writing your own name is often an IEP goal but the other tracing apps in the app store don't make this activity easily accessible AND achievable. We had this particular activity in mind when we created Write My Name. I love the customizable name tags -- and I can't wait to see how pleased Leo will be when we help him fill out a bunch of these tags with the names and photos of his favorite people and things -- which will then let him practice writing the names of those items. ...then click on your name tag to practice writing your own name! what Leo's letter tracing ability actually looks like. and dependent on tracing ability but not fine motor precision. The following video shows Leo and Write My Name in action. He loved this app -- and I appreciate that it broke him out of the Speech With Milo: Prepositions app rut he'd been stuck in this week (we love the Milo series, but right now the Milo music is the soundtrack of my nightmares). Again, it's been a while since I've been really impressed with an app. This one's more than worthy of you or your child's time, and your $1.99. Disclosure: we were gifted a copy of the app, but the opinion expressed here is my own. I only review apps worth reviewing. That app looks great! I bet Max would love it! Thank you for your review. I bought this app, but I’m a bit disappointed because it couldn’t keep my 5 year old autistic son interested for more than a few minutes. It also crashes sometimes. My husband and I think language and handwriting are very important for our son, so we went on searching an app that would motivate him, and we found LetterSchool. My son loves it and can play for a long time. Yesterday he grabbed a pencil and wrote the whole alphabet!!! We would never had thought that a month ago. On the website I read that this app is very suitable for children with special needs. My four old son loves the Write at Name app. He is very interested in writing his letters but gets frustrated, possibly because he can't grip the pencil properly. My son likes the picture cards that you can customize the best. We started with family members and have now moved on to favorite toys. Thanks for the recommendation. We use this every day. You have never steered us wrong yet, so I bought this on your recommendation. I was not disappointed! Today, Nik used the stylus to trace his name. Over and over and with such immense pride. No small feat for my boy with CP and vision issues along with the autism. This could be game changer for Nik.